TOTO has the desire to improve everyone’s quality of life for almost a century with their innovation. They have changed the perception and inspired others of what a bathroom can be and how it can be used. TOTO’s philosophy has always been ‘people first innovation’ and they stand by their statement well always. Their designs, quality, and ecology have been the best in the market. You will get every sort of design you want from cheap to high-end options and each product is made with care and innovation. Yet before you think to buy a particular toilet, always make sure to choose according to your need. Here is some buying guide for you before you hit the payment button. The shortened and narrowed down list will help you to find the suitable and most sophisticated quality product from TOTO toilet system for yourself. TOTO high profile two-piece toilet set has a high efficiency and durable functional structure and double cyclone flushing action. They prefer holistic design for best performance, quality and functionality. They have the dual flush and the double cyclone technology. They are powerful but very quiet flush toilets. They have a wide 2-⅛ inches computer designed trap way and saves 20% of water over 1.6 gpf toilets. They come with a large water surface and universal height. They are reliable and durable which translates into reduced maintenance cost and unmatched superior performance. It includes tank cover, polish chrome trip lever, and fittings are included with the toilet set. 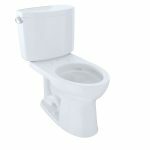 This is a decorative high profile toilet and comes with the comfortable ergonomic design. The rim has no hole which makes the toilet easier to clean and gives a seamless appearance. The super smooth Sanagloss prevents debris, molds, and bacteria sticking to the edge of the toilet. These have the double cyclone flushing technology and powerful, quiet flush. They are WaterSense approved high-efficiency toilets. They have Sanagloss Super smooth, ion barrier which cleans your toilet with every flush. They come with ergonomic design unique seat and universal height for maximum comfort. They have built-in soft close hinge system which eliminates the annoying toilet seat slams. This high-quality fixture can bring all the effortless beauty to your bathroom. It uses gravity combined with a cycle bowl clean and Sanagloss glaze. This is helpful for cleaning and long-term toilet sanitation. They are a combined system of compact one-piece toilet and bidet. 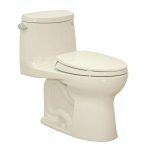 IT is a great dual flush toilet that meets all the ADA compliance. They have an automated flushing mechanism and use minimal water. They have a wireless remote control operation and a heated seat. The ultra smooth ceramic glaze helps the toilet to be clean for a longer time. This is one of the best toilets in the present market and popular in the households for regular use. The toilet uses both gravity and a powerful flush system. It is an ADA compliant toilet and consist of low consumption double cyclone flushing system. It uses 1.28 gallons of water per flush which maximizes the cleaning system. It uses water efficiently and reduces the accumulation of dirt, so cleaning time is also less. The two nozzles utilize the water better and minimize the bacteria and dirt. The elongated bowl gives extra comfort and the design is most functional and fashionable as it is a one-piece skirted design with a high profile tank. It has a soft close seat with the latest smart seat technology and chrome tip lever. This is a modern and classic style one-piece toilet with elongated bowl and it will immediately beautify your bathroom in no time. It’s tornado flush, a hole-free rim design and dual nozzles produce centrifugal washing action that assists in rinsing the bowl efficiently. that It is easier to maintain, unlike the two-piece toilet system. It uses 1.28 gallons per flush with a Tornado flush system for a powerful rinse. It has the Cefiontect glaze that gives the bowl a lubricious quality which prevents particles from sticking on the edge. It has the soft close seat which prevents slamming lids. This toilet is WaterSense, CALGreen, ADA, and CEC compliant. TOTO is a brand that brings all the essential functions under your budget. They are affordable, stylish and fully functional for your bathroom. This toilet meets EPA criteria and is APA complaints about your worry-free use. This toilet has Dual-Max flushing system and it uses less water consumption and it has chrome push button. It has an elongated skirt and comes with universal height. It has a close coupled elongated front bowl and tank set. It uses 1.6 gpf water and it’s WaterSense certified. This is an elegant, elongated low-consumption toilet which has a siphon jet flushing action. It has a comfortable ergonomic design and the smart innovative soft close seat. This toilet is 10 years old innovation but still looks very modern. It is a single piece toilet with low profile tank. It has powerful and quiet flush each time you use it. It has a 3 inch wide flush valve which is 125 percent larger than conventional 2-inch flush valves which produce the fast flush. It comes with a large water surface and fully glazed trapway. It has a one-year limited warranty. 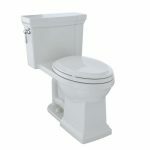 It is a decorative two-piece toilet with elongated bowl shape and comes in universal seat height with easy installation. This ceramic design is highly comfortable and functional. TOTO products are affordable and smart looking and they go on for a long time. It is combined with a chrome trip lever and high-efficiency double cyclone Tornado flushing system which uses only 1.28 gallons of water per flush. The SanaGloss or CeFionTect finish to the toilet keeps the bowl clean for a longer time. It is WaterSense certified and the power source is corded electric. It is eco-friendly. Types of toilets: The various types of toilet systems are for different places, those depend on large or small bathroom and personal choices. The two-piece toilets are traditional models which have separate tanks and bowls. They are good for tight place problem areas and easy for DIY installations. The one-piece toilet styles eliminate seam from bowl and tank. They look sleek and are sometimes more expensive ones. The bowl height is also an important factor as the standard toilets are 14 or 15 inches above the floor, but some are 17 tom19 inches long which are easier for seniors and with limited mobility. Flushing Power: There are various kinds of flush toilet systems and you can choose any of them according to your need. The Gravity Fed Toilet relies on the natural force of gravity to force water from the toilet tank to the bowl. They create a siphon action and generally perform well in any condition. The modern dual flush models are of two types: partial and full flush. New models use less water as 1 gallon in a partial mode for liquids. But it is possible to end up with two flushes for some models. The Pressure Assisted toilets have sealed internal tanks where the air pressure builds up when filled with water. The force of the pressure creates a blast of water, which evacuates the waste from the bowl but with an additional loud noise. The Power Assisted toilets hold 1.6 gallons of water and use a small horsepower electric motor to create air pressure into a sealed tank. The High-Efficiency toilets use a powerful flush system with a minimum amount of water usually 1.28 gallons or less per flush. They are water-efficient models. Bidet toilet system: Theses kind of toilets can be found mostly in North America and they are essential in many parts of the world. They promote healthy hygiene and nearly all Japanese households have a bidet toilet system. Seating Styles to choose: Comfort is important and when you choose a toilet seat make sure to fit that in your toilet for maximum comfort. Heated seats are a very comfortable option as they warm up the seat with very low voltage heating. They have a separate thermostat which controls the temperature and keeps the seat heating. Bidet style seats have the facility of cleansing and some of them even come with pre-heat water, dual jets (front and back) and air drying system. Some of them have motion activated light which helps to find it in the dark. Slam-less lids are especially liked by the women as they close gently, avoiding any loud crashing noise. Some toilets inhibit the growth of bacteria and fungi and they also reduce the molds and odors. Take a look at the quick release hinges which are helpful when you want to clean the toilet as they will let you remove the entire seat. What is the tallest Toto toilet? Toto toilets come with different heights. Standard toilets have a height of 15 inches while the comfort height toilets have a height of17 to 18 inches. What is universal height for Toto toilets? Universal height toilets are also known as comfort height toilets. Universal toilets from Toto have a height of 17 and 18 inches. How much does a Toto toilet cost? Toto toilets come in different prices. Their price range $300- $1100 depending on the type of toilet and the design. What is the smallest Toto toilet? If you have limited space in your bathroom, you should look for Toto Aquia Dual Flush Elongated Two-piece toilet. It is the smallest from Toto. How do you remove a Toto toilet? When removing a Toto toilet, you should follow the following procedure. Disconnect the water supply from the Toto toilet. You will find a flexible hose which is connected below the tank. Follow the hose to access the valve. Turn the handle on the supply valve to the right. Remove the lid from the tank. Turn the trigger at the top in an anticlockwise direction to unscrew the trigger at the top. This should be done before removing the lid. Flush the water by pressing down the handle. Continue holding the handle downward to ensure that the flapper is open. This will also help to drain the remaining water. Wipe the remaining water using a sponge. Loosen the bolts that connect the tank and the hose. You can now use a screwdriver to remove the caps at the bottom of the toilet. 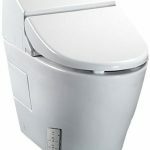 How do I adjust the water level in my Toto toilet? Disconnect the water supply from the toilet. Turn the water valve which is mounted below and behind the toilet tank in a clockwise direction to close the valve. Look for the flush valve which is located within the toilet. Turn the top of this flush valve in an anticlockwise direction. You can turn it ½ to unlock the adjustment tube. You can now adjust the valve to adjust the level water. If you want to raise the water level, you should lift the water valve upward. To lower the water level, you just need to push the flush valve downwards. Now you can return the water supply back and refill the tank. Flush the toilet to confirm that the adjusted water level is correct. Does Toto make a comfort height toilet? Yes, Toto is a well-known manufacturer of comfort height toilets. Most of them have a height of between 19-21 inches. TOTO strives to create assurance about the quality of the product and the affordable price range. They are trusted by people around the world and they are always ready to contribute to the betterment of society.